Sciblogs | Chasing a comet- totally newsworthy so why isn’t it top billing? or best shirt-worthy? Welcome to a comet. 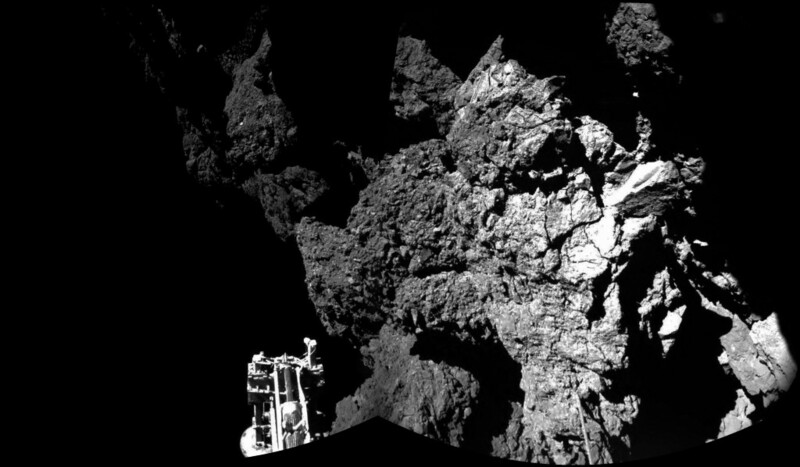 Photo by European Space Agency taken by Philae. Philae may have bounced off the comet before landing, but it was the local media lack of focus on this event that had the real lack of thrust. This week has seen a truly epic event in human history. It’s an incredible week for space exploration and research as well. After ten years of waiting and untold hours of human effort and planning, the European Space Agency unmanned space probe Rosetta disengaged her landing vehicle Philae Lander and landed on the comet 67P. Landed on a comet! Cheer here _______. If this event sounds simplistic, it’s not, even to a mere biologist. Comet 67P was travelling at an astonishing 66,000 km/h and to prepare for the landing Rosetta needed to first do a complex manoeuvre before releasing Philae. For Philae to then successfully land onto 67P it had to harpoon into its surface, with the comet still travelling at 66,000 km/h and employ its thrusters. But as it turns out the landing was less than smooth– it appears that both of these failed, Philae bounced (in fact landed twice) and has settled next to a cliff sideways, tentatively holding on despite very low levels of gravity. Yet all appears as if it is currently still ok. Philae and Rosetta are communicating and there have been some astonishing pictures sent from both. The audacity of landing on a comet and planning to do so many years ago is truly incredible and something to be celebrated in much the same way as man landing on the moon. This event is one of several shouting out in the last couple of years that space exploration is still something to behold and marvel at. It’s certainly had me gripped in the months leading up to it, and particularly in the last few days. It may even be voted the Science Breakthrough of the Year. Yet in New Zealand at least it’s been under-reported and undervalued by the media. Appearing last night, for example, as the 4th news item on TV3 news is a totally unworthy place for this event. Following the social media campaign of this mission via Twitter (@Philae2014, @ESA_Rosetta) has however, been edge of the seat, personable stuff. It’s a story that everyone can engage with young and old. ESA have wisely written both these accounts in the first person and when they detached from each other the tender supportive messages between them were endearing. You have, though, to know about these social media accounts, something about this event, and indeed be active on social media to be tapping in to the news this way. For many people, mainstream news is still a major way in which they receive their news, and their science. What has caused the highest level perhaps of distraction however, away from the actual captivating events is the regrettable, audaciously chosen shirt choice of ESA Rosetta spokesperson Dr Matt Taylor, printed with scantily PVC clad women. Hardly a professional shirt choice, hardly shirt that screams out yes scientists, those male in particular, are carefully considering how to make science less sexist. Yes, ESA, wants to be at the forefront of gender equality in the sciences as well as the forefront of science. Disregarding the questionable shirt choice, most people are fascinated by space. If we want to have a more scientifically literate society (as outlined in the government’s Science in Society document- A Nation of Curious Minds), then ensuring our news is showing the hottest science is surely a priority? If the public aren’t given access to the science and in the exciting way some science stories beg to be told, such as Rosetta and Philae meet 67P, then how can we expect a more literate society? How will Mum X and Dad Y then pass the news onto their child Z that may then go to school and tell friends A, B and C, and teacher D, that then starts a topic of inquiry without the appropriate aid of the media? Or alternatively, another regrettable scenario, that child Z hears of this at school, or reads online her or himself and then tells Mum X and Dad Y who because of the news portrayal see it a a less important item for discussion and don’t engage as a result. Even better for children, teachers and parents, when they see scientists in the media, that they are presenting an image worthy of the science story they are telling, and better yet modelling a type of scientist to emulate and to respect- one that doesn’t give girls cause to disregard science as a career choice all because of a shirt. Mainstream media have still such an important role to play in telling science stories. And I believe we do have a nation of curious minds- let’s all help to provide those minds with plenty to be curious about. Let’s all do our bit and let’s all do it really well. Well apparently this comet is a rock and not a dirty snowball, like the hypothesis suggests. But luckily there is a percentage of the population with enquiring minds. Thank fully we have the Internet and can escape from the monoculture of the television. Well it bounced because the surface was harder than expected, the harpoons failed to deploy. Thankfully science is not a monoculture too, and ideas that have good scientific reasoning get a voice on the internet, where as in the scientific establishment this isn’t always the case, as sometimes voices that have good reason to disagree with a “theory”, can get drowned out. There are alternatives to the hypothesis that dirty snowballs formed planets and in fact it could be that planets formed the comets. But anyway if you want to watch some news (that isn’t monoculture) about the comets here is a short video about 5 and a half minutes long, that has some very interesting science behind it and it might open your minds, as it did mine. With some findings from the Rosetta stone. Well latest update from the thunderbolts crew. Examining the possibility that this is more likely to be interplanetary debris than ice. A great video with some good actual photography that supports this theory. It is less than 5 minutes long !